My mother, Cath Bates Dimmock, has been the head coach and coordinator for the Argyle Secondary high school gymnastics team for the last 10 years, all volunteer. She has been a role model for countless kids and provides love and care wherever and whenever needed. I see the kids line up to give her a hug at the end of the night and it’s pure magic. They love her and see her as a mother figure, which many do not have. She has been changing lives for a decade and I couldn’t be more proud of her. She helps out two to three days a week, plus hours of paperwork in between – she is usually running off her feet. She is so busy between October to spring, all with gymnastics volunteer work. Moulding these children into who they want to be, giving them an ear for someone to listen, a hug at the end of the night…these things are so minor, yet so important. 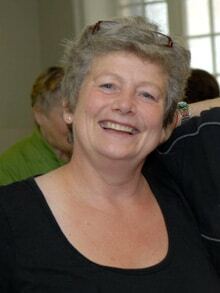 If you want to give an award to someone extremely special in our Lynn Valley community, Cath Dimmock is your woman.. I can’t believe how much she has conquered in 10 years – changing lives right before my eyes!! Thank you for considering her. I would like to nominate my friend and neighbour Bette Geddes for this year’s recipient of the Good Neighbour Award. Bette is the culinary genius behind Sharing Abundance weekly meal programs, where she leads and directs a team of dedicated volunteers to produce over a hundred three-course meals for service each week at our various locations. Bette’s menus are varied and tasty; a treat her loyal group of followers look forward to each week. Our guests say that they can taste her love. As my partner, Bette also helps with the management functions and the critical support needed to help keep this charity viable. For several years now Bette has provided the catering to the Lynn Valley Gala, this year creating a multi-course meal for over 600 guests. This is no easy feat without a kitchen! Bette liaises with the organizing committee to work out the logistics of setting up a temporary outdoor kitchen that meets the high standards of Vancouver Coastal Health and the refined palates of the community guests. Through her work with the Lynn Valley Lions, Bette has created a partnership with them to provide the food and service help for our Sharing Abundance Christmas dinners. Bette has also provided the catering for the annual seasonal celebration for the North Shore Disability Resource Centre for several years. Bette is truly a gem sharing her passion for great food with our Lynn Valley community. Thank you, Bette, for all you do. We echo Lizz’s thanks, Bette. Your work is truly amazing, and we love to see community groups like the Lynn Valley Lions and Sharing Abundance working in partnership to become mutually stronger and even better able to achieve your goals of helping others in our neighbourhood.